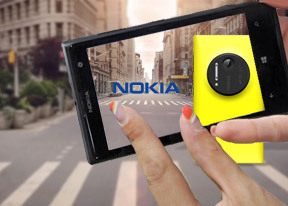 Nokia has created a special app for the Lumia 1020 dubbed Nokia Pro Camera and is one of the phone's key software features. It is there to compliment the 41MP camera with a simple user interface that allows users to fine tune the camera settings. It may sound intimidating, but Nokia has done a great job at making the app simple to use for both novices and professionals alike. Starting the Nokia Pro Camera reveals a familiar interface, first introduced with the Smart Camera app. The important distinction is the top transparent box in the top center containing six camera adjustments. From left to right they are flash, white balance, focus, ISO, shutter speed and exposure compensation. Tapping on each of them opens a ring-based interface on the right part of the screen. You can access all of them simultaneously by sliding the on-screen shutter button to the left. This will stack sliders for all six settings next to one another allowing you to easily fiddle with them at the same time. The settings you modify are kept at the values you chose, while the others are adjusted accordingly by the app. We really like this interface - it's intuitive and powerful at the same time. However, there's a downside to Nokia Pro Camera and it's that it takes 4 seconds from the moment you press the shutter to the moment it's ready to shoot again. We guess having to process both a 5MP image and a 38MP image is proving a bit much for the older Snapdragon S4 Pro chipset. We tried disabling the high-res image - that is shoot only a 5MP image - but that wasn't any quicker. Another thing we noticed is that the processed image does not look like the viewfinder image - we noticed when shooting one of the charts for the photo quality comparison tool (the third one, shot under fluorescent lights), the white balance on the viewfinder looked okay, while the final image is too cold. We also spotted it when shooting the low-light sample with the flash off - it may be so dark that the viewfinder shows black, but the final image actually is pretty bright. This is a pretty big issue as you rely on the viewfinder to tune the image using the manual controls. As we mentioned earlier, the Pro Camera lens has another cool trick up its sleeve. It snaps two photos at once - one in full resolution and another one in 5MP, which benefits from the pixel oversampling technology, while at the same time being far easier to share. You can zoom in up to 3x for the 5MP photo without serious degrading the image quality (you'll be losing the advantage of supersampling but it's still much better than the digital zoom in other phones) and you don't have to make a decision on the spot - you can zoom out and in after the fact and even reframe the photo. There's no HDR mode here but there's something pro's will appreciate better - automatic bracketing. You can set the camera to snap 3 or 5 photos in ranges starting at -0.5EV to +0.5EV or -3EV to +3EV (the number of photos taken affects the available range). You can post process the images later in your app of choice and fine tune them to your exact specifications, unlike HDR modes on most phones that often do too little or too much. The only problem with this is that photos are taken as usual - 5 exposures at 4 seconds each is a lot. You can rely on your app to align the images later, but you would be better off using a tripod. We do wish Nokia provided some way to combine exposures on the device itself. The Nokia Pro Camera app isn't limited to shooting still images, it can also manage video capturing quite well. Tapping the video icon on the bottom gets you to the video part of the app. There you have access to just some of the settings - flash, white balance and focus. The focus can be set to either manual, auto or infinity. Video recording also makes use of OIS and oversampling. Zoom is enabled even during video capture and it can go up to 4x in 1080p mode and 6x in 720p resolution. The Nokia Lumia 1020 also has two mics (one on top, one on bottom) with the company's proprietary Rich Audio Recording for distortion-free sound recording in loud environments. The 1080p videos are recorded at 30fps, of course. You can start shooting videos by either tapping on the screen or pressing the dedicated hardware shutter key. Pausing video recording is still not an option on Windows Phone 8. Thanks to the dual high-quality microphone setup on the Lumia 1020, the audio quality is very crisp and boasts a lot of detail and texture. The default Windows Phone 8 camera can only shoot 5MP photos and it only takes a couple of seconds to do it - still slow, but not as slow as the Pro Camera. The UI is pretty simple - you have your viewfinder and some controls on the right. From top to bottom they are the still/video camera toggle, front/back camera toggle, a flash mode setting and the Lens button. On the left you have an arrow that takes you to the images taken with the camera, alternatively you can swipe to get there. There's also a slew of settings, ranging from scenes and effects to white balance, contrast, saturation, sharpness and ISO among others. You have a dedicated Macro focus mode but no face detection. The flash can be set to auto, forced or off. A separate setting allows the LED to work as an AF assist light. In the latest camera software Nokia has raised the maximum ISO setting from 800 to 3,200 and has tweaked image processing in low-light conditions. SkyDrive is available for photo auto-upload (it's turned off by default), but you can install third-party apps to handle this functionality as well. Lenses is an interesting feature, allowing third-party camera apps to enhance the core camera functionality without the need to access them separately and get use to their different UIs. The so-called Lenses are like plugins for your camera and they are available directly in the native camera app. They show up in the list of installed apps too in case you'd like to pin a Lens to the start screen, for instance. The shutter key will wake the phone up with a single press and launch Pro Camera but you can set the native WP8 app or Nokia's exclusive Smart Camera to be launched instead. So, we've mentioned Smart Camera several times already and it's time to explain what it does. It's the next generation of Smart Shoot and is based on technology developed by Scalado (now owned by Nokia). It shoots a burst of 10 photos at 5MP resolution and allows you to edit those photos later. When editing a Smart Camera photo you choose one of several modes by swiping through their respective cards, each with a helpful label. The basic feature here is best shot - automatically selecting the best photo out of the 10 (you can manually override the selection). You can also select the best expression for each individual face in the photo. The multiple photos can be used to remove moving objects as well. Then there's Action shot - a moving object is overlaid on the photo several times to create a sense of motion. You can pick which of the 10 photos are used to create the action shot and the multiple copies can either be opaque or semitransparent. The other mode that enhances motion is Motion focus - it locks the moving object, but blurs the background around it. Imagine turning the camera to track a fast moving object, that's the effect that Motion focus simulates. Here's a promo video done by Nokia that shows an example use of the Smart Camera. Anyway, Nokia has other Lumia-exclusive Lenses too. There's the Panorama and Cinemagraph (creates animated GIFs), but also GlamMe (to enhance self-portrait shots) and a few more. As of July 2013, the Cinemagraph lens has been updated and now supports 720p resolution for the .GIF files. At least that's how it's supposed to work anyway, the GIF our 1020 uploaded to Nokia Memories (the only way to share the file) only had a resolution of 800 x 450 px.